Is this beis [be'eto] kosher? Is this caf [artzechem] kosher? I would think that the chuf is kosher since it is not meruba 90 degrees. 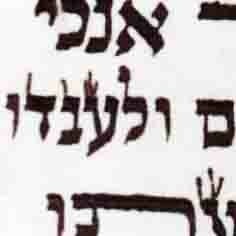 The ב seems like a shailos tinok since there is a little of a blita going to the right. (Although I admit I would personaly make this a shailos chacham). I printed this out and showed it to R' Shammai Gross this morning. His maskana after looking at it a few times is that the Chof is pasul. The Beis he said a tinnuk should be asked. Why should the Beis need a Shailos Tinok when there is a Blita on the right bottom corner? Doesn't the A"R Shulchan Aruch say that an Akev Av is according to Kabbalah? Does that not mean that any Blita sticking out of that lower bottom corner would suffice to be called a Beis? See also Mishnas Hasofer #22 Siman Hey. Akev Av is according to kabala, but a minimal akev might be me'akev to differentiate between this Beis and a caf? 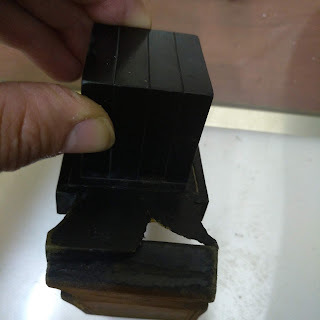 But even according to a thought that a square edge or anything boilet is suffice - that doesn't automaticaly make it a kosher beis, it isn't so easy to differentiate between this beis and a caf, so even if accepted hallachicaly as a zavis/akev it still might be problematic or shaylas tinok! 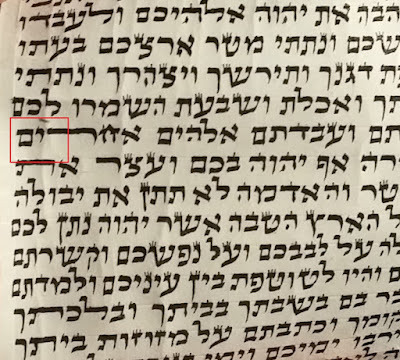 See the AR on letter caf that has a square zavis top and bottom right-side is pasul because it is דומה לבי"ת that means it might not be a kosher beis, but still not accepted as kosher caf either. It looks to me that the bottom corner of the chuf is not exactly 90 degree angle. Although from the screen it could be a little different in seeing it in person. Cant machshir in this case through a tinok? R' Shammai at first said it was a shailos tinnuk. He then looked a few more times, covered up the letters around it, looked again, thought..Finally said that it's pasul.